As early as 1848, Poles began settling in the Chautauqua County city of Dunkirk with the families of John Gollon, Paul Ostrowicki, Frank Urban, and Ambrose Jasiek being some of the earliest. From these pioneering families, the community slowly grew, from 13 families in 1857 to over two dozen by the middle of the American Civil War. These first Poles attended the German Catholic churches where Father Francis Xavier Szilak, a Jesuit priest, would occasionally visit to celebrate Mass in Polish. By the 1870s, the Polish settlement grew to the point that they needed their own parish. A committee of community members including Frank Kusneske and headed by Theodore Weiss sent a request to Bishop Ryan for a priest and permission to build a church. The bishop replied that he was working diligently to find Polish priests for the diocese and would appeal to Rome with their desires. Around the same time Polish seminarian John Pitass transferred to Niagara University, graduated, was ordained, and established St. Stanislaus Church in Buffalo, NY. With one of their own in the diocese the Poles of Dunkirk began coordinating with Father Pitass about forming a parish. In the summer of 1875 Father Karol Lanz applied for missionary work in Buffalo and the bishop immediately sent him to Dunkirk. 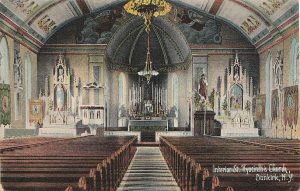 On August 5, 1875 nearly 20 years of work by the Poles of Dunkirk culminated with a groundbreaking ceremony and the formal establishment of St. Hyacinth Roman Catholic Church and Father Lanz got to work immediately. Moments after the parish was created, it celebrated its first baptism, that of Peter Paul Szubarga, son of John and Elizabeth (Michalski) Szubarga. With a fairly sizable congregation Father Karol began building a church that summer. Utilizing the unemployed members of St. Hyacinth, the church’s foundation was done by September and the cornerstone was laid. Construction continued all fall and winter until the finished church was dedicated on March 12, 1876. The large brick building had room for 400 parishioners, six stained glass windows, two oil paintings of the Madonna and St. Hyacinth, and a large bell donated by Dunkirk brewing magnate George Dotterweich. By the end of the month the church saw its first baptism Sophie Waltrowski, the daughter of Theodore and Anna Weiss, and its first wedding, between Melchior Kittel and Maria Ralscy. Father Lanz stayed until 1879 when he decided to join the Benedictine Order. The parish he started left a lasting impression on the man who chose the name Father Hyacinth upon entering the order. Following Father Lanz’s departure, St. Hyacinth went through 9 pastors in 17 years. During the intervening years Father Anthony Klawiter organized a parish school in the early 1880s, Father Victor Zareczny incorporated the parish in 1887, and Father Anthony Lex built a new brick school in 1894. In 1896 Father Bartholomew Swinko arrived in Dunkirk and stayed for almost 20 years. He paid off the parish debt, prepared and dedicated the parish cemetery, and played host to visiting prelate Archbishop Franciszek Albin Symon, the papal delegate to America’s Polonia. As St. Hyacinth’s profile grew so too did the rest of Dunkirk’s Polonia, including many of the civic organizations like the Lutnia Choir, which became one of the leading groups of the Third District of the Polish Singers Alliance. Fathers Michael Helminiak and John Sliwinski oversaw the parish through the Great Depression, Second World War and Korean War. Slowly the parishioner-built church began to show its age and Reverend John Sliwinski undertook the task of building a new church. Land was purchased across the street from the first church and in 1960 construction of the present parish site began. The completed modern church was dedicated on April 23, 1961. Like Dunkirk, St. Hyacinth began to decline in the later quarter of the twentieth century. Despite this the devoted still attended the church including Lillian Halisinski who according the Vatican was miraculously cured in 1984 by the intervention of Blessed Mary Angela Truszkowska. In 2008, as part of diocesan restructuring, St. Hyacinth’s and St. Hedwig’s parishes were joined creating a new parish, Blessed Mary Angela Truszkowska. The new parish now uses both worship sites. Album Pamiatkowe I Przewodnik Handlowy: Osady Polskiej W Miescie Buffalo, Z Dolaczeniem Okolicznych Miejscowosci Ze Stanu New York. Buffalo, 1906. Andrasik, Diane. Dunkirk. Charleston, SC: Arcadia Pub., 2008. Print. Drabik, Michael. "Cemeteries of Dunkirk New York." Searchers 5 (June 1991): 10-12. Print. Ederer, Martin F. "Catholic Polonia in Western New York - 7 Dunkirk's Polish Parishes." Am-Pol Eagle [Cheektowaga, NY] 20 Jan. 2005: 14. Print. Felckowski, Myron M. "Joannem (John) Gollon." Joannem (John) Gollon B. 11 May 1834 Gulcz, Lubasz, Poland D. 28 Dec 1912 Hull, Portage County, WI USA: Myron M Felckowski - Our Family History. Our Family History, 27 July 2015. Web. 15 Jan. 2017. Fronczak, Francis Eustace, Aleksander Pitass, and Mieczyslaw Haiman. Ksiega Pamiatkowa Zlotego Jubileuszu Osady Polskiej I Parafji Sw. Stanislawa, B. I M. W Buffalo, New York, 1873-1923. Buffalo, NY: Nakladem Komitetu Wydawniczego, 1923. Print. "Obituary - Frank Kusneske." The Fredonia Censor [Fredonia, NY] 12 May 1926: 2. Print. "Parish History." Blessed Mary Angela R.C. Parish. N.p., n.d. Web. 15 Jan. 2017. Program Pamiatkowy Drugiego Zjazdu Trzeciego Okregu Zwiazku Spiewakow Polskich W Ameryce W Dniach 3-go, 4-go, 5-go Wrzesnia 1911 Roku. Brooklyn, NY: Z Drukani Czas, 1911. Print. "St. Hyacinth." Polish Parishes of WNY - Detail. Polish Genealogy Society of NY, n.d. Web. 17 Jan. 2017. 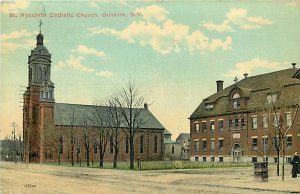 St. Hyacinth Church, Dunkirk, New York 1875-1975. So. Hackensack, NJ: Custombook, 1975. Print. Thirty-Fifth Anniversary and Testimonial Dinner In Honor of The Rev. Casimer A. Zak. 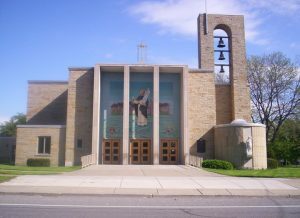 Dunkirk, NY: St. Hyacinth's Parish, 1980. Print.